Paravent Mosaïque is a very high-resolution video (13,600 x 3,400 pixels) originally created for the video screen mosaic wall located in the multimedia corridor of Espace culturel Georges-Émile-Lapalme, Place des Arts, Montréal. It was commissioned by Société Place des Arts in partnership with le Conseil des arts et des lettres du Québec (CALQ). 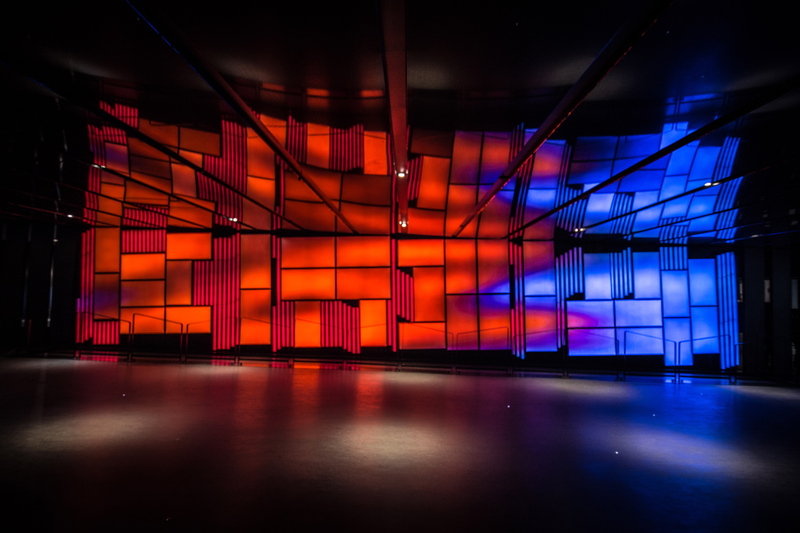 The mosaic wall is a permanent installation device composed of 35 HD monitors (46 and 55 inch) and embedded sound, as well as Versatubes (light tubes), nearly 3 meters high and 12 meters long. The Paravent Mosaïque (2016) video may also be projected (horizontally or vertically) on large architectural walls. Paravent Mosaïque is created from a newly designed Max MSP software patch, which powerfully converts the wave patterns of the wind into complex layers of generated video and sound sound. The wind data archive was produced by 64 networked motion sensors making up Heimbecker’s Wind Array Cascade Machine (2003) while it was installed on the rooftop of Montréal building with a history of digital arts and cinema. The audio and video generated by the new ParaMo software borrows from the idea of “coloured hearing”. Strong winds are visualized in red, while calmer winds are visualized in blues and greens. Paravent Mosaïque has an image ratio of 4:1 that is a significant elongated format of the source data. This elongation makes the visualized effect of the wind flow more powerful and dramatic compared to more common aspect ratios such as 3:2 or 16:9. If requested, the ParaMo generative software may be used by Heimbecker to create new site-specific audio and video. Modifiable image and sound parameters include: video duration (up to 30 minutes), video size (pixels), colour design, sound design (and diffusion) and even the selection of specific wind data files from Heimbecker’s wind archive. Additionally, Heimbecker with his experience with site-specific sculpture and installation may be invited to design and present Paravent Mosaïque on new LCD multi-screen structures for permanent exhibition installations where time and budget allow. The official launch date of Paravent Mosaïque occurred at Place des Arts on September 1, 2016.